New York Mafia: What’s happening to the Five Families? Police said Cali’s killer shot him at least six times and then ran him over before fleeing the scene. Family members were seen to rush into the street and sit crying next to his body. The motive was not known, according to police. NYPD Chief of Detectives Dermot Shea said in a news conference on Thursday that Cali may have been lured outside the home by a car accident before he was attacked. Detective Shea said his Cadillac SUV, which was parked outside the home, was struck leading to Cali to rush outside. After a minute-long conversation, the assassin pulled out a gun and opened fire on him, police say. “Needless to say, with the potential organised crime angle, it gets the utmost importance [of] the NYPD and the entire detective bureau,” the detective said, adding that video exists of the attack. 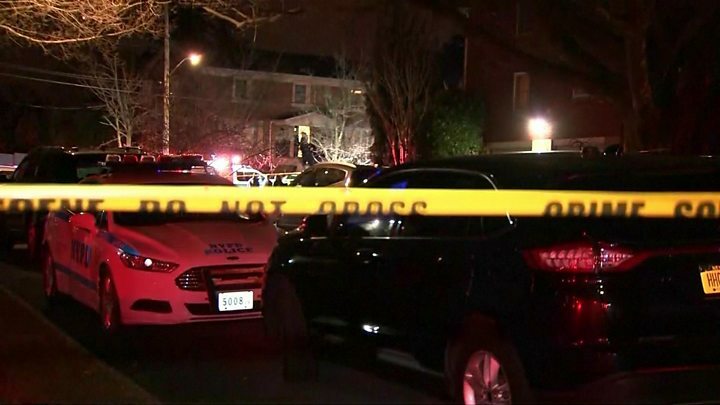 New York media say it is the first killing of a family boss in the city since the Gambino family’s Paul Castellano was shot dead outside a restaurant in 1985 on the orders of John Gotti. Gotti then ran the Gambino family until he was convicted in 1992 of racketeering and five counts of murder. He died in prison in 2002. The Gambino family was once considered the biggest organised crime group in the US, but began to decline after Gotti and other senior figures were jailed. Staten Island’s affluent Todt Hill neighbourhood is renowned for its crime connections. It was used as the location for fictional crime boss Don Corleone’s compound in the 1972 film The Godfather. Paul Castellano also owned a home there. Neighbours Will and Karen Curitore told CBS News the neighbourhood always seemed safe to them. “We know there used to be a mob presence here,” said Mr Curitore. “I guess unless you’re in the mafia,” Mrs Curitore added. On Wednesday, two heads of the Bonanno family, Joseph Cammarano Jr and John Zancocchio, were acquitted in a Manhattan court of racketeering and conspiracy to commit extortion. Last October, 71-year-old Sylvester Zottola, a reputed associate of the Bonanno organisation, was shot dead at a takeaway restaurant in the Bronx, New York. The attack came three months after Zottola’s son, Salvatore Zottola, was also shot, but survived.